I’ve been working on this script for a long time. I finished a rough (very rough) first draft of my next play two weeks ago. I feel like I opened the door to a new room in my house. I’d been writing on different versions of this script – it seems like forever – and I just stalled out. I had written around the edges, came up with long memory scenes, and did a lot of visual research. Oh did I do research. And it seemed – no – it was – I somehow got lost in my research: there were so many stories I wanted to tell about taxidermy. And antique crystal. Parrots that sing Mozart. Historical estates with ghosts. Timber frame barns. I’ve taken a lot of workshops, classes and I’ve been part of several writing groups over the years, but I just had this “want” : I needed to write this story by myself. I wanted to feel that it came out of my own authentic voice, without any influence or commentary. I just didn’t expect the authentic gridlock that came with it. Earlier this summer, I just had to end this checkmate. I took a dive into joining the recent Seedlings Dramaturgy Workshop, and for most of the writing sessions, I hedged and hawed and couldn’t seem to go forward. I brought just a few pages in, and heard them read out loud, and it just seemed this time – this is so much harder than working on my other scripts. The other playwrights shared great comments, and I had some really poignant feedback. But when the workshop was winding up, I still hadn’t made much progress. And then. The teacher of the workshop, Jennie Webb, asked me a series of “what if” questions. Somehow she was able to ask me questions that helped me see what I wanted to do with the script. I still don’t know how she did it. She’s really a great teacher / dramaturg / word artist. Thank you Jen. And so, after those “what if” questions, for several horrid hot summer nights, I spent hours writing until after midnight, wondering how I was going to wake up in the morning. I kept the air conditioning on. I drank a lot of ginger beer. I tried out my new “progressive” glasses, took them off, put them back on. But there I was, deep in the script, finding my way through it. 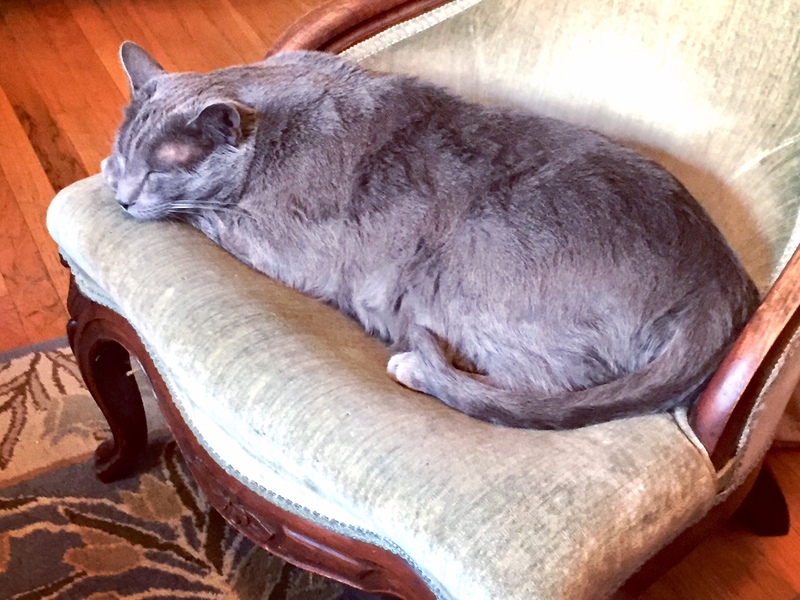 My grey cat, Ted curled up in the chair next to me, every night, and I would play a soundtrack of rain (with birds) and thunder and the wind in the trees. Especially during these hot summer nights, the sound of that rain, and the rumble of thunder made me feel like I was writing in another world. Could you please tell us more about those what-if questions? You. Thank you. Your words and worlds are a gift.